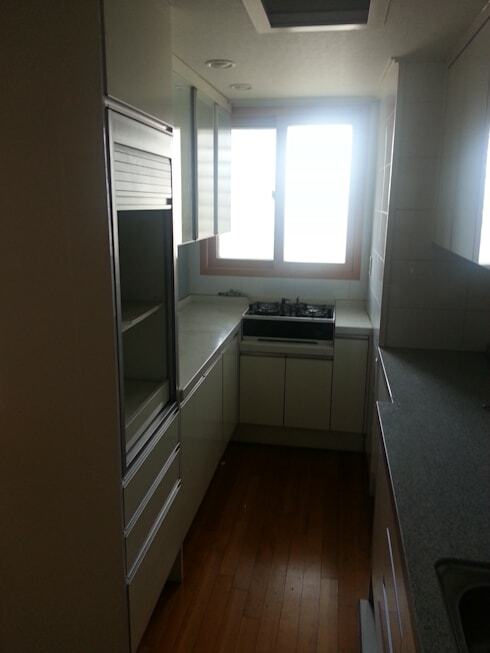 This narrow and impractical kitchen design is unattractive and cramped. The lighting is poor, leaving the room looking ugly and undesirable with very little space to enjoy cooking in the tightly squeezed environment. An entire overhaul of this kitchen was necessary to get it looking lovely and welcoming again. The old, tired and cramped space has been replaced with a bright all-white design that will definitely impact on the mood of the homeowner. Sleek and chic just got a whole lot fancier. This modern space is now comfortable and elegant with so much natural light for an even more contemporary appearance. The floor-to-ceiling sliding glass doors create an appealing atmosphere that is just so attractive and unbelievably spacious. 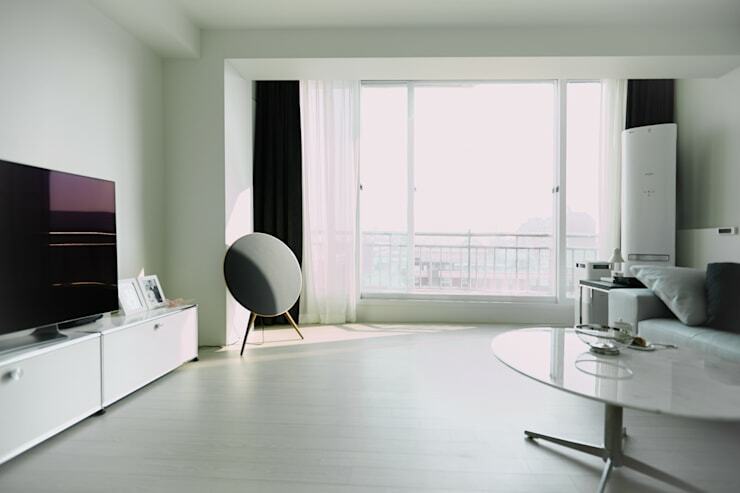 The minimalist detail and all-white walls accentuates the bright and cheery effect of the sunshine, while making this room warm and serene too. Here we see a full picture of the open-plan kitchen and dining area. 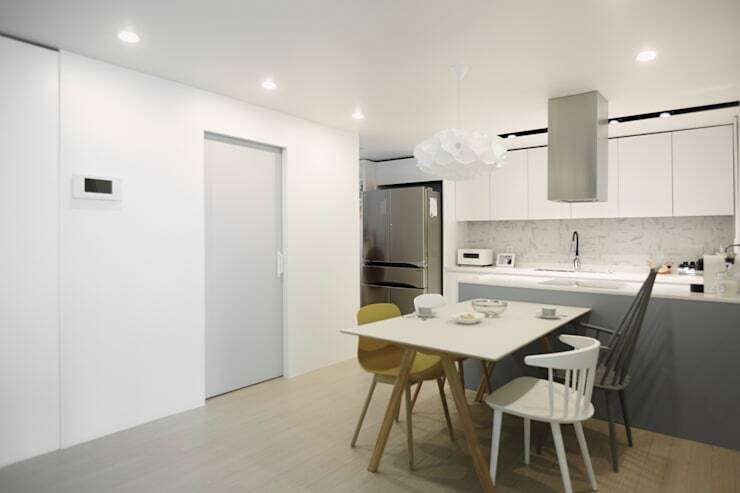 The apartment is spacious and welcoming, with modern appliances, minimalist white cabinets and a simple wooden dining table creating an elegant Scandinavian-inspired design. The décor is somewhat eclectic, with mismatched chairs giving a unique effect. But, as a result of the spacious environment, this apartment is an excellent choice in which to entertain and socialise. The all-white bedroom décor is another continuation of consistent design. But, if you look closer, you’ll see a balcony too, allowing for fantastic fresh air to become part of the décor. The folding glass doors create a seamless effect for the outdoors to become an extension of this bedroom space. An air-conditioner has been incorporated into the bedroom for those hot and humid summer days too, so you’re never away from comfort and style. This new dressing room allows the bedroom to look a lot larger and more spacious, keeping all clothing, accessories and products in one splendid part of the home. 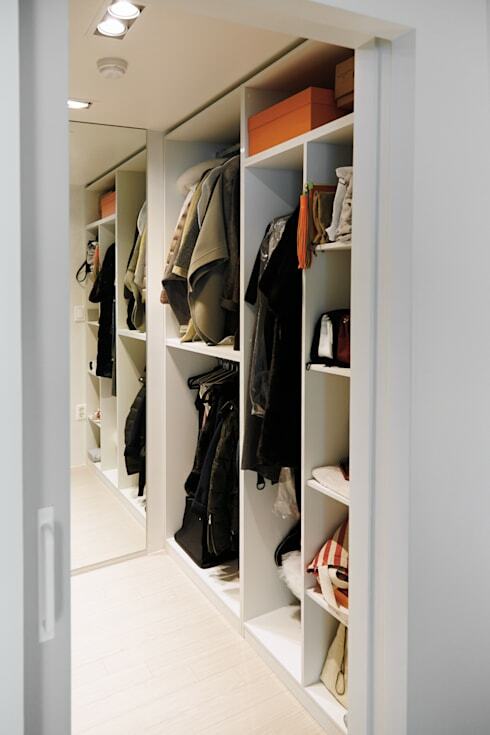 This offers plenty more storage than the conventional wardrobe and also allows the bedroom to look tidier and uncluttered. It's a great use of a spare bedroom or underutilised corner, and could just be the answer to your storage problems! 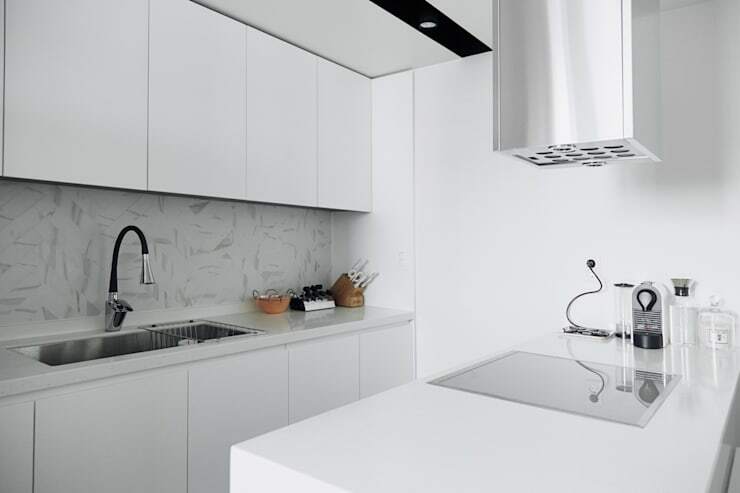 If you liked this modern, minimalist apartment, don't miss: The tiny modern apartment with all you need. What did you think about this modern home revamp?